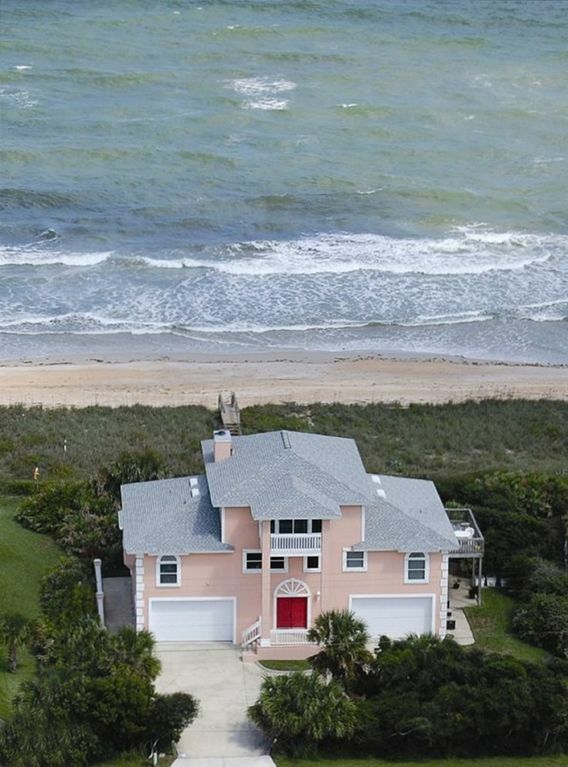 Watch the surf and let the dolphins entertain you at this oceanfront home nestled in the sand dunes in South Ponte Vedra Beach on the east coast of Florida! Enjoy a cup of coffee on the huge deck and watch the sun rise over the ocean. In the evening, sip your cocktail on the third-floor deck as the sun sets over Guana Lake. Your vacation retreat is just minutes from great restaurants in Ponte Vedra Beach, Jacksonville and St. Augustine. The famous TPC Golf Course, home of The Players Championship, and The World Golf Village are also nearby. Disney World, Sea World, Universal Studios, Dolphin Cove and other Orlando attractions are an easy day trip as is the Kennedy Space Center. A list of area activities and restaurants will be provided prior to check-in. Beginning in Thanksgiving our community hosts the Nights of Lights, a beautiful display of Lights and Christmas trees throughout the area. Our House follows this theme with dazzling exterior lighting as well! An ideal time to bring your family! The house was architecturally designed by its owner. It has three separate guest suites, each with its own heating and air-conditioning. The master suite has a king-size bedroom facing the ocean, and a second bedroom with a set of twin beds. The master suite bathroom has a double whirlpool tub, double shower, double sinks and a bidet. The other suites each have a king-size bedroom and a twin bedroom with separate baths for each suite. For small children, a youth bed, port-a-crib, high chair, stroller, boogie boards and beach toys are available as well as an outdoor shower. The expansive great room is 45 ft. long with a 24-foot-high cathedral ceiling, and large picture windows overlooking the ocean. The kitchen is open to the great room and has fabulous views of both the ocean and Guana Preserve. The third-floor loft has seating areas and outdoor decks facing the ocean and Guana Lake. Light and bright with beach décor, this home is open and cheerful. Outdoors, wraparound decks overlook the ocean and a dune walkover gets you on the beach in seconds. Pack your flip-flops and swimsuits and take a trip to paradise! We have had 23 small family weddings on our beach and because the house has a great room that is 45 ft long and a vaulted ceiling of 24 feet high, it has been very suitable that if happens to rain to have the wedding inside. The space can accommodate up to 30 people. The house has 7 single beds and 3 king sides beds + youth bed and a pack and play bed+ 2 pull-out sofas queen size. PLEASE NOTE: DURING HOLIDAYS AND PEAK VACATION PERIODS, SEVEN-DAY RENTALS ARE REQUIRED. I've been listing my rental property with VRBO/HomeAway for almost 20 years now, supporting travelers and their vacations to the best of my ability with five-star reviews. I searched the entire Southeastern Coast from MD,VA,NC,SC,GA plus the whole East coast of Florida plus the Keys and Gulf side, out the Panhandle including AL. and found Ponte Vedra to be the absolute best. It is close to the large and growing southern city of Jacksonville which features excellent performing arts, professional sports, fine restaurants and activities. My home is just a few minutes away from St. Augustine and it is within a few hours driving distance to Orlando, Daytona and the Kennedy Space Center. The temperature here is more moderate and less humid than other parts of the South. I bought the lot in the 1980's, designed my home, supervised the building of it in the 1990's and have been extremely happy with the results and my chosen area as has have my family, many friends and guests. ON the beach with lots of marine life activity, peaceful uncrowded beach to watch the dolphins play and the occasional breeching of whales, nesting of the giant loggerhead turtles and the fiddler crabs digging their nesting holes in the sand. Shelling is great, surf fishing, beach glass and sharks teeth hunting. Seeing the sun and moon rise out of the sea and the beautiful sunsets over Guana Lake and Perserve. Walking in the extensive parkland trails of the Guana Perserve is a treat and is only a few minutes away. Dining at the unique varied fish camps along the Intracoastal Waterway and watching the private boats and fishing trawlers go by as you dine under the massive oaks with their hanging moss.